Today on the breakfast table there was a very peculiar structure of a 3 pieces croissant which probably leaded Sushi's staff to go towards the world of design (maybe not the all world...), but of course this isn't the only reason, everything started when "Maria the digital mate" pointed out Verner Panton's web site: www.vernerpanton.com It's a nice place to have breakfast, isn't it? But I think that everything came out yesterday in the afternoon. 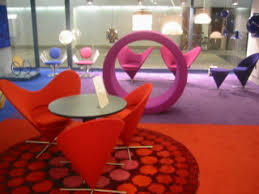 I don't know why I started to talk about Verner Panton, but I was sure you'll love it. By the way, if you guys have time and money, you can go to Munich and visit this place www.atomic.de, it will remind you Verner's furniture. Hey Ed do you know a cool place for dinner? Posted by Sushi for 2 at 3:24 p.m. Awesome! I remeber the Atomic Cafe.... Heffner's gig.... right, we were saying ...dinner... how about some sushi for 2? If anyone need to use urgently the credit card, go to www.okversand.com and buy me a freaking lamp! Yo quiero, quiero, quiero,... comer en ese sitio!!!!!! I want to go to have breakfast there!!!!!!!. The best place for dinner is Ed's place! And it's free!!! !